Thackrey is an eccentric, some say enigmatic winemaker who crafts his distinctive wines at his home in the town of Bolinas which he bought in 1970 ("Time in Bolinas is so very small, the clock on the courthouse ain't working at all....and the mayor of Bolinas is digging for clams, but folks in Bolinas don't give a damn") He likes to tell the story that he loved the view from the house but wanted to spruce up the fence, so he planted grapevines along its base which eventually produced grapes which lead him to....you can see where it led him. In his bib overalls with the words, "Famous Winemaker," embroidered on the bag in gold letters, Thackery strikes you as a farmer, but when you speak with him he impresses you as a scholar. If you visit his website, www.wine-maker.net, you will find a beautifully composed review of the history of the making and understanding of wine. It is derived from his over 600 volumes of old and ancient texts on wine that form his personal library. 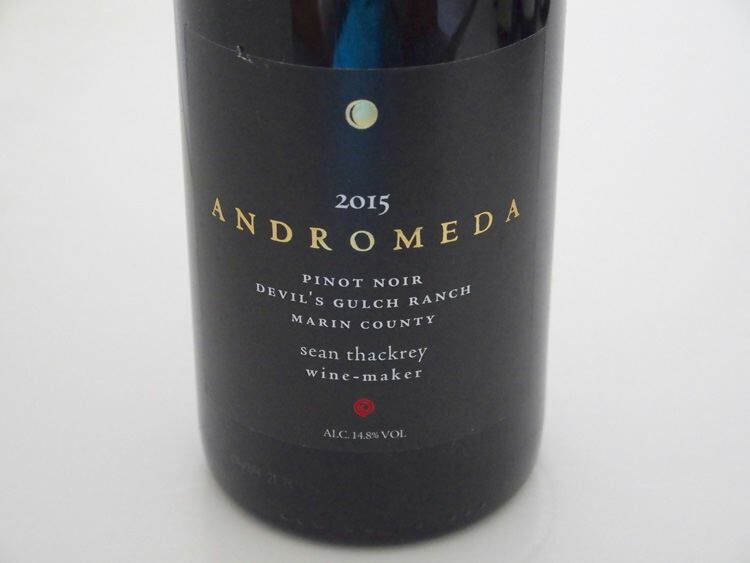 He uses these texts as inspiration for his winemaking in contradistinction to most winemakers who use the latest information from University of California Davis as their guide. The information provided on the website is a prodigious undertaking but reads clearly and is well-organized. If you want to find out about his wines, you have to look elsewhere! Many of his winemaking techniques are historical and for the most part were abandoned about the same time as the invention of shoes. He is suspicious (or disdainful) of the University of California at Davis approach to winemaking, criticizing their technique as sterile in nature. He is committed to creating natural wines and is more than willing to take risks in order to create wines of personality. 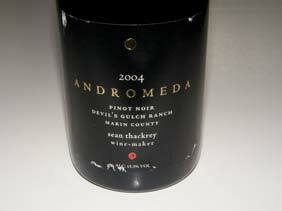 I believe the first vintage for Andromeda was 2002 and most people are surprised to find out that Thackrey crafts a Pinot Noir. His Devil’s Gulch Vineyard Pinot Noir is like no other Marin County wine with more heft and alcohol than any other. The wines are not described on the website and are sold to a mailing list with limited retail distribution.